The other day I was looking on Sacred Gin’s website under “Exotics”; this section features limited editions or single bottlings of varieties of Sacred Gin, including some of the most interesting distilled ports that I have ever heard off. Then, subtly placed at the bottom of the list, I saw an entry for Christmas Pudding Gin. Father Christmas is in for a treat this year! So how is it made? Christmas pudding is infused in Sacred Gin for three months and the resultant liquid is then re-distilled and bottled. Having recently undertaken extensive experimentation with mincemeat vodka/liqueur, I thought I’d give it a try. Neat: It starts off softly and then starts to warm your mouth. Quite a strong flavour of dark fruit cake, a similar bitterness. The juniper still is there, but the overall flavour is about much more than that. A few minutes after drinking, my mouth feels like I’ve just eaten some Christmas pudding, including getting a sense of, strangely enough, its texture; it’s unusual, but I like it. Frozen: Certainly an improvement on room temperature: drinking it from the freezer brings out the fruit from the pudding. Mostly raisin, but some other mixed fruit too. The gin is incredibly smooth. but has a little warm kick at the end. Tasty. Martini: A crisp Martini with a slightly different finish; not citrus, but again, a slightly cakey, dark richness and some mincemeat spice in the mid-notes. I never thought a Martini could be partiularly festive, but I guess I was wrong. Toddy: I’m usually a fan of hot toddies anyway, but this particular one has something else: it is cosier and more comforting, as the usual dry element of this drink, from the gin, is replaced by a gentle spice. Really, really good. G&T: Quite a nice gin and tonic, sweet and quite refreshing. A little burnt fruit at the end. Good, but I think there are better ways to appreciate the gin. In conclusion: I do find all of the experiments that Scared get up to very interesting, and if you haven’t heard of them, it’s worth checking their website. With regards to the Christmas Gin, it was something I really enjoyed, both for the novelty and for the flavours. I found that almost every drink I tried it in finished with a combination of toasted sugar and the dark, cakey after-flavour of Christmas pudding. I’m not sure how many bottles are left, but if it sounds like it appeals to you, I’d buy sooner rather than later. 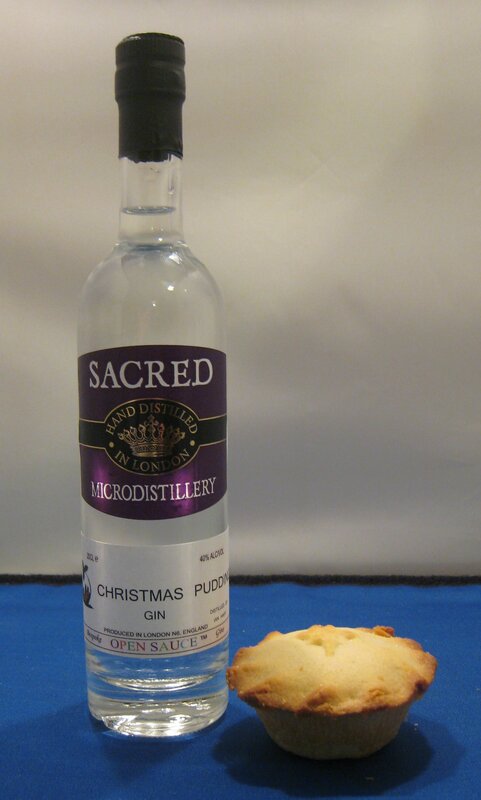 Sacred Christmas Pudding Gin is available for £14.95 for 20cl from their website. This entry was posted in Product Reviews and tagged Christmas Pudding, Christmas Pudding Gin, cocktails with..., festive spirits, Gin, Gin Review, gin tasting, London Cut Gin, Purchased, Sacred Christmas Pudding Gin, Sacred Gin by DTS. Bookmark the permalink.